I just picked up a nice CT-Seven, but no remote. Anybody got one I can buy? I’ll bet there’s one in the Burgh. I’ll take a run at them and check for you. Robert- I used to have a couple, and programmed universals myself. That was years ago, no original now. Ray- If you find one, that'd be awesome! Kevin - I suspect that all the functions of a CT-7 could be duplicated by the remote on the contemporaneous CT-17, which I have a couple of. Robert, I'll give it a try if you can send me one, I'll check it out. That eBay remote is my next best option. Kev - I suspect that the remote for the HR-722/752 models would work also. 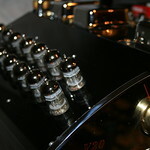 They are all the same vintage, and have the functions you need for a Tuner/Preamp. In fact, I suspect that they all have the same exact tuner. But if you don't have one of those in your hoard, I can mail you one for a CT-17 to try - just bring it back at the Fest. Got one on the Bay! - maybe the best outcome; hopefully it's an original. Bring it to the Fest, if you think of it, and we can find out for sure if it is coded the same as the CT-17 I referred to in early June.